This is my absolute favorite chicken salad! Heat barbeque or cast iron grill on medium heat. Baste both sides of chicken breasts with olive oil and season on both sides with salt and black pepper. Place chicken breasts on the grill and cook turning often until cooked thru about 12-15 minutes. Remove from grill and slice into 1 inch cubes. Heat 2 tablespoons olive oil in a large scan pan or non-stick pan on medium heat. Add onions and sautee until translucent about 5 minutes (add additional oil if needed). Add garlic and saute for 1 minute. Add curry and turmeric and saute for 1 minute. Add almonds and raisins and saute until almonds are nicely toasted and raisins are warmed about 3-4 minutes. Remove from heat. 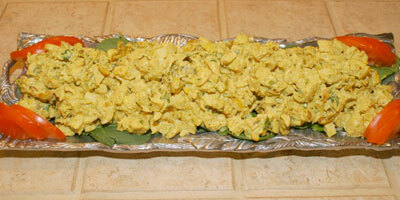 Combine chicken, curry mixture, cilantro, mayonnaise, yogurt, lime juice and salt in a large mixing bowl. This dish can be served warm on a bed of spinach and a side of tomatoes with toasted bread of your choice to make sandwiches. May also be refrigerated and served cold as well. *Can be prepared one day ahead.